trucks going threw - - - 8 messages. Showing 1 through 8. We watched a 4 wheeler go down over on long point on Saturday. I think my days are done till next year. 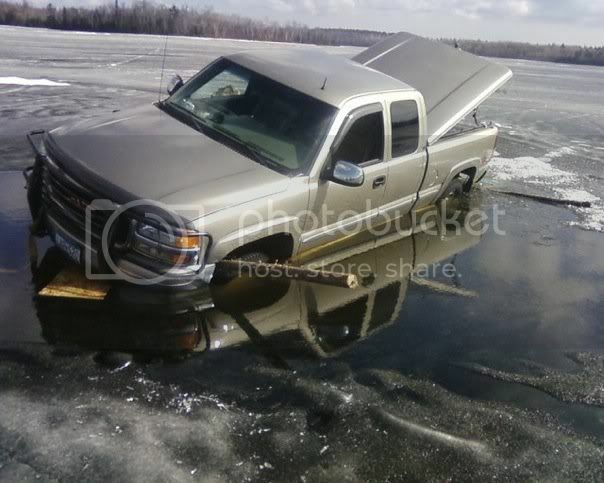 You have to be either crazy or stupid to still be driving a truck on the ice. I'm unaware of any drivable ice anywhere in the state right now. 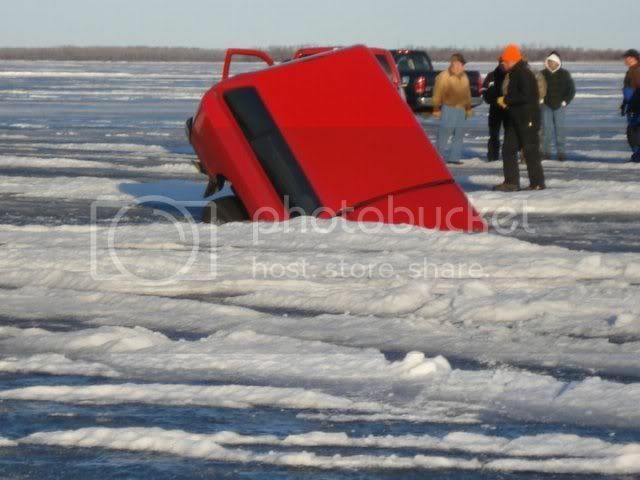 So in that last picture I see 1 truck through the ice and 2 more behind it. What do you think the owners of those trucks are thinking? i know if it was me i'd be long gone!!!!!!! I was out today on peltier. Accessed via the dock. I walked out and as I was walking there were spots that bowed under my weight. When I got to the holes I was surprised to find 15 inches of ice. It made me feel safe so I went around kicking open old holes and fishing for a while. Then I kicked through a hole and found less than 4 inches of bad ice. That had me scared because it was about 20 ft from a spot with 15 inches. I recommend people not even try anymore in the metro. Even though I moved all over and didn't fall in there were definitely spots that a good jump would have put me through the ice. I risked it to try and find some nice crappies I located a week earlier. Didn't find any, I think they are sitting outside the spawning grounds getting ready but I didn't have the nerve to search the lake anymore so I headed in. On the way in I walked within shouting distance of a guy open water fishing. He yelled "Your nuts!" I told him that I wanted to be the last guy to fish the ice and I'll bet I am. Today the DNR put out a warning for all metro lakes. Everywhere in the metro and even pretty far north is very unsafe as of now i was up monday on west rush and had the same finding. Some places have a decent amount of good ice, and some places have three inches with 8 inches of slush underneath.